The Coady program continued to attract students throughout the 1980s, and by 1989, 1,838 persons from 103 countries had come to Antigonish to study. As the programming in the 1970s responded to development priorities emphasizing logical problem-solving models, the 1980s saw the influence of new ideas in social development in the Coady’s educational offerings. Dr. A.A. MacDonald identified a number of key documents in the late seventies which highlighted the limitations of the models in place. Liberation theology in Latin America challenged the Church to take an active role on addressing poverty and injustice. The Declaration of Cocoyoc in 1974 and the Dag Hammarskjold Foundation’s 1975 report brought forth the concept of “basic needs”, while the Pope Paul VI’s encyclical, Populorum Progressio introduced the phrase “preferential option for the poor” to theological and development discourse. Popular education, inspired by the emancipatory learning theories of Paulo Freire, also grew at this time, and informed the Coady’s existing work in non-formal adult education and community development. 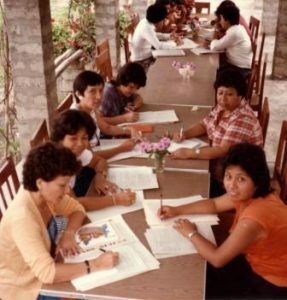 The 1980s produced a broad collection of documentation recording overseas activities in training, workshops, and consultations with graduates and partner organizations. This represented the Institute’s program of “institution strengthening.” The decade saw ongoing programs conducted in partnership with key organizations including Silveira House in Zimbabwe, SANASA in Sri Lanka, several church-based organizations in India, San Gil University in Colombia. John Dobson conducted a series of training programs through the early 1980s in Latin America enabling community development workers to build their expertise over time.